"Time as he grows old teaches many lessons." As the year 2012 rolls in closer to us, the Aztec sun stone increases in popularity and curiosity as well. We know some very important information about the Aztec calendar history and we also understand some elements of what it holds for our future also. We know that the Aztecs were called that name by the Spanish, it is also known as the empire of the Mexican though. These people fell victim to a man by the name of Hernan Cortez in 1521 and due to his attack, their culture was destroyed and their temples were demolished. At this time, the Aztecs were destined to fall into a forgotten state for over 100 years. Soon, the Aztec sun stone would rise again and the speculation about the Aztec calendar history would surge. In the year 1790, the people of Mexico began to become very interested in the area's past, before the Hispanic culture. This was in large part to a discovery made in El Zocalo, in Mexico City. Here, they found a disk that measured an astonishing twelve feet and contained a combination of both art and science. This piece was the Aztec sun stone. While people looked at the hieroglyphs that were on the stone, no one understood the full Aztec calendar history or what it could offer. One particular piece, the Fifth Sun holds the key to unlocking the true mystery of the piece. There isn't a lot to go on, but many believe that this might be a look at the Mexican cosmos that occurred back in the day when it was created. Around the edges of the Aztec sun stone, we find there are fire serpents that connect at their faces. Their tails are joined together to signify the day that a ritual was to take place. This was estimated to be around 1011 A.D. What is interesting is that there are knives that appear between the teeth and there is also a bare claw that is grasping a human's heart. There are four Gods also depicted for the various seasons and an apparent fear of jaguars also is evident on this piece as well. During the periods of the Aztec calendar history that is shown, is that each cycle ends with a disaster as well. These are from wind, fiery rain and massive flooding. There is no idea on what this all means and thus helps to fuel the mystery on what it all entails. What is found to be pretty common though is that the calendar goes over 18,980 different days. During this time, no two days would be repeated as well. Along with that sacred periods would only occur once every 52 years, which made them a rarity in themselves. On the Aztec sun stone, there is another shocking item as well. There is depiction of the Gods sitting around consuming human blood and hosting sacrifices as well. Along with that, the only other odd piece was the fact that a New Fire ceremony had to be done each year for the orb to reappear and to ensure that the human race would continue for the next period of time as well. 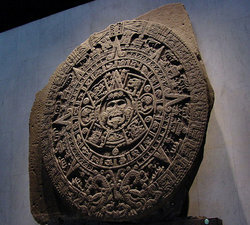 While there are numerous elements in the Aztec sun stone that remain a mystery, there is little doubt that the Aztec calendar history is one of those that continues to drive a little curiosity out of all of us, to understand what it means and what it can tell us about our futures as well. 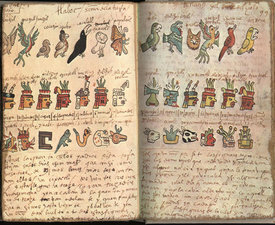 Folios 98v and 99r of the Codex Tudela, a 16th century manuscript. This section relates to the hieroglyphs of the Aztec calendar.